When millennial pink finally became a thing mid-2016, I'd been waiting more than half my life for the return of this childhood favourite. As someone 5'2ish, I've often felt the need to downplay factors of heteronormative girlyness because I often had to look older for work-related reasons. Unfortunately, being younger and female isn't always a helpful combo for workplace empowerment. So understandably, I was elated when bubblegum pink re-emerged as a new trend that rendered youthful nostalgia into sophisticated unisex adulthood wearability. The color pink brings me back to the baby powderish smell of barbie dolls and their squeaky rubber limbs. Or my sixth birthday party when after putting on a pink tulle princess gown my mom and I had picked out at Sears for the occasion, I became acutely aware of how overdressed I was, and had to hide out by the stairs while my classmates waited in the living room below. Old trends often seem like they're back again out of nowhere, but most actually follow a schedule that runs like clockwork. According to Vocativ, movements experience a resurgence every 20 years or so. Doc Martens, choker necklaces and bellbottoms are some examples of such trends that made comebacks after 18-21 years. It make sense that millennial pink came back. And regardless of how long it sticks around, I'll be living out the rest of my days in these cherished hues. Beyond the resurgence of former favourites, there are a multitude of new trends these days birthed almost entirely online. But how long exactly, does it take an internet flavour of the month to go from cult meme to bonafide mainstream ubiquity on the racks at Forever21? Approximately five years, if you ask Vaporwave. Vaporwave is what I call the visual accompaniment to Chillwave, a genre of pop music (example here); it's also an online trend that has only recently reached mainstream offline actualization. Back in 2012, Vaporwave started popping up via visual blogs and collections on tumblr and other obscure sites; its Lisa Frank-inspired sister movement, Seapunk, also gained a bit of momentum at the time and was briefly adopted by mainstream acts like Rihanna. Last year, Esquire deigned to announce that Vaporwave, (though I still think they meant chillwave,) was long over as a musical genre. But they were wrong. The visual aesthetics of the movement continued to endure, though in increasingly watered-down formats and venues. Vaporwave finally hit mainstream fashion in 2016. Beginning from late 2016, a smattering of lavender and violet looks in pastels, iridescent fabrics and tie-dye patterns could be seen on the runways at Miu Miu, Michael Kors and Kenzo, and more recently at retailers like Zara and H&M. It's official, Vaporwave has finally made its way from internet gestation to IRL fashion trend. 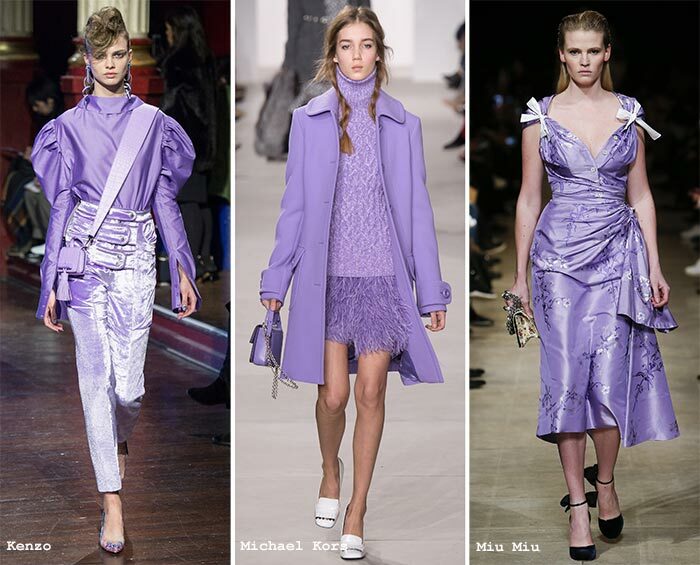 Last week, Pantone announced Ultraviolet as the 2018 color of the year; proving that a trend is never truly over till it becomes color of the year. Nevermind that media are calling it the "color of science", or that Pantone calls it "the color of the cosmos", Ultraviolet is a new incarnation, if not an extension, of Vaporware. Nothing could be more sci-fi, space agey, or wonderfully futuristic in that (sometimes problematically fetishized) Japanese way than Vaporwave. It's here, finally.